November 11, 2015 - Version 2.3(c) launched. Connection to the purchase pages now used http instead of https. Reason: Windows Server 2003 does not support the TLS protocol (it uses SSLv3 instead). In 2015, browsers no longer accepted SSLv3 over https connections. Note: Server is upgraded to Windows Server 2008 on August 2, 2016. March 26, 2015 - Version 2.3(b) launched. The Free Trial has been extended to 30 days. This release adds no new features, but fixes a bug that persisted in the previous version. The bug concerned the three Forced Motion buttons in the Checker panel. Their activation was often not consistent, requiring the user to move the square cursor a second time inside the chord to get the correct activation of the buttons. May 17, 2014 - Version 2.3 launched. Java 1.6 is now the minimum version needed for HarmonyBuilder. The Educational 365 version is implemented. This allows the program to be activated for 1 year for a deeply discounted price. The Green Button in navigation panel now plays the selected note when in Chord Navigation, and the whole chord when in Note Navigation. Key Signature entry now changes automatically according to what the selected bar key is. Screen drop-outs no longer occur. Launching offline no longer triggers "Your Trial has expired..." pop-up. Fixed bug where arrow keys occasionally became deactivated. February 24, 2013 - Version 2.2 launched. See screenshot. Extra items added to the Set Melody > Fixed Note menu, allowing more enharmonic notes to be recognized. Previously, there were no Voicing Generator results for certain unrecognized melody notes in the keys of G#m, C#m, F#m and D#m. New registration mechanism allows computers with complex configurations to be registered for the Trial. Offline installation is now compatible with Trial. Batik 1.6 modified to eliminate the error pop-up when saving a song (May 15, 2013). 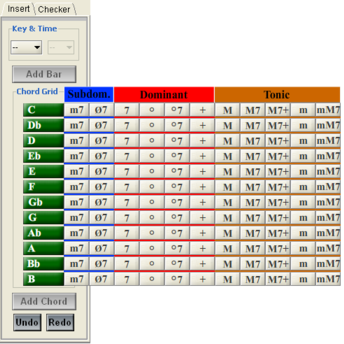 Batik 1.6 modified to eliminate the error pop-up when multiple time signature and/or key signatures are used (May 31, 2013). Fully functional 7-day Trial with optional 14-day extension after submitting a short survey. 6 new Time Signatures added to menu: 1/2, 2/2, 1/4, 5/4, 9/8 and 12/8. A new note selection pop-up has been added to the Note Edit panel, making it easy to add chosen notes to score. Notes can now also be enterd into the score by pressing keys A - G on the alphanumeric keyboard. Notes move at a controlled pace when Shift + Up/Down arrow keys are used. Empty bars (at end of score) can now be removed. Warning pop-up now appears when program is exited with unsaved changes to score. Name of song file now appears in the menu bar. The Static Cursor checkbox now automatically deselects when Play is pressed. Single Add | Remove button is implemented in Voicing Generator panel. 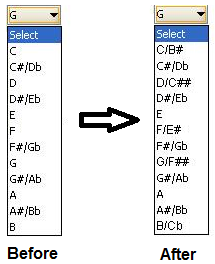 When in Set Melody or Set Bass Note, the Target Key menu item is automatically selected when compatible with the selected note. Instrument and Volume settings are now saved in the HAB file. Fixed problem of program reverting to Demo mode (i.e. deactivating) when computer's Network Connection changes. Corrected missing green circles in one chord. Corrected missing blue circle in 8 chords. Corrected missing choice buttons with Set Melody > III+ selection. Corrected missing chord voicings with Set Melody > vii dim selection. Corrected missing chord voicings in keys of G#m, C#m, F#m and D#m. Corrected missing 1st Choice button when i7 is selected in key of G#m. Fully functional 7-day Trial, but the trial can be extended by 21-days after submitting a short survey. Once installed, all the features will be available for the length of the trial, provided there is a connection to the Internet. Chords can now be added to beats with mixed rest durations. Redesigned Navigation panel with a Quiet Mode for moving silently through the score. Buttons added to advance or retreat by 1 bar. Also, the square cursor movement can now be controlled from the front panel. Redesigned Note Edit panel. Now, notes can be made longer or shorter, and chords can be added or removed. Also, triplet management has been simplified. Rate of nudging is now at a controlled speed when the nudge button is kept pressed. Resolved issue of rests remaining pink after they are selected and then deleted using the "Del" key. Resolved issue where deleting ½ notes (after selecting with pink box) leaves a ¼ note undeleted. Fixed missing Successions check between Tenor and Alto, when Soprano note is deleted. This version is packaged as a fully functional 30-day Trial. Once installed, all the features will be available, provided the host computer is connected to the Internet. Note: an Internet connection is only required for the Trial version, whereas the Activated version is a standalone application and can run offline. Redesigned Chord Selector wheel. Switching between Triads and Seventh chords is now much faster. Selection of Target Key in Builder > Choose Next Chord panel can now be set to Auto, which automatically sets the Target Key as equal to the Current Key. Selection of Soprano note in Builder > Set Melody panel is now automatic, based on which soprano note is selected by the square cursor. Selection of Bass Note in the Builder > Set Bass Note panel is now automatic, based on which bass note is selected by the square cursor. In the Builder panel, the results menu pops down automatically, after Find button is pressed, for quicker selection. New navigation feature introduced: move thorugh the score one bar at a time, using Shift +right/left arrow keys. New navigation feature introduced called Lock Cursor Position: move through chords in the score while keeping the square cursor in the same position. End button now jumps to beginning of last bar, with last bar aligned to LEFT edge of viewpane. Resolved issue of notes becoming pink when pasted into previously copied locations. Resolved problem of natural sign appearing in front of pasted notes, when copied from notes with an enharmonic flat sign. Solved issue whereby chords turned pink when pasted into a location where previously there was material that was mass-selected and deleted. 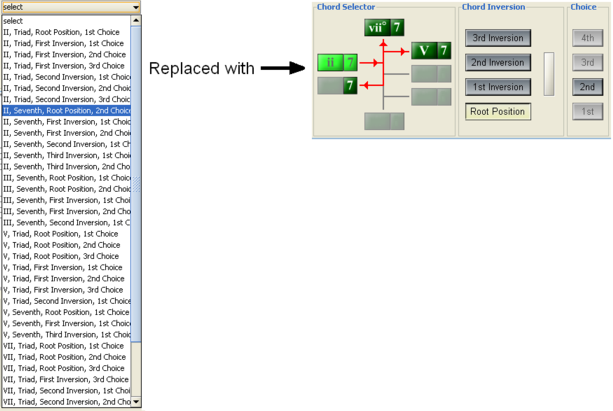 Solved issue whereby, for all minor keys, when either i or iv is selected in the Chord Selector (for both Triad and Seventh chords), and First Inversion is selected (with any choice), the Voicing Generator results all come out with one incorrect note (the bottom note). March 30, 2011 - Version 1.1 released. See screenshot. Mass Delete capability (including UNDO Mass Delete). END button now moves square cursor to first chord in last bar, instead of last chord in last bar. “Please wait…” popup now appears when Builder panel is clicked for opening. “Esc” brings up a pop-up providing an option for de-selecting copied text or chords. Song files are now saved with the following extension (.HaB). Builder > Set Bass Note > Bass Note menu is lengthened to eliminate slide bar. In the Key = D, a C natural now has a natural sign in front of it. Fixed problem of non-recognition of notes denoted with a forward slash in Builder > Bass Note menu. Fixed problem of square cursor disappearing when pick-up bar is used, and Empty Bar is added. Fixed case where sound is heard if a note is tied and the second note is nudged. Code for "FIND" button is migrated from C++ to Java, making "FIND" button compatible with Macintosh OS. Scrollbar added to "Insert" and "Checker" panels allowing access to buttons when application is opened on wide screen monitors. January 1, 2010 - Version 1.0 launched. See screenshot. Automated generation of optimal chord voicings.